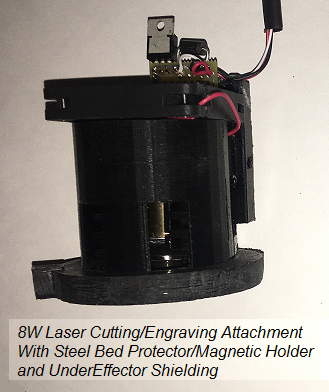 EZMOUNT Universal Attachment L-Cheapo Mark 5 Laser etching attachment 8.0W output. Optionally Includes metal bed cover to protect glass and to attach workpiece with magnets and laser protection glasses. Can cut up to 3mm colored plastic or plywood in one pass. Does not cut metal. Etch many materials quickly including grayscale. There are a variety of programs available to produce gcode for the function that you need or use the firmware to convert slicer gcode option. Lots of Ventilation is necessary!! Carbon Monoxide kills!! This is considered experimental and must be used with an abundance of caution and knowledge of laboraty practices. Customers must execute a separate release to purchase this attachment. Due to functionality and safety, EZMount attachments are only sold to registered owners of our 3d printers.